oomph. : SHARE THE LOVE GIVEAWAY. this month, it's raining red and pink here at oomph. and whether you love valentine's day or not, it's still symbolistic of love, and it's not only for couples. i love to shower the minis with hugs and kisses and hearts and goodies. it feels just as good to give as it does to receive. 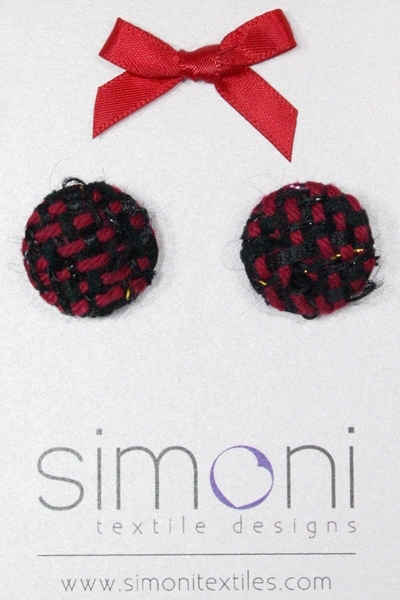 so here's your chance to win something red...this one of a kind, hand-woven pair of earrings courtesy of simoni textile designs. keep it for yourself or share the love with your mom, sister, daughter, or friend. follow me publicly on google friend connect and leave a comment with your email address. I'm now following simoni textile designs on Twitter! Cute giveaway! I foolowed you as Fani amd I like Simone textile designs on Fb and I left a comment as Fani Guda. this giveaway is soo lovely! I followed Simoni Textile Designs on fb. And I follow you on twitter, too. oh those earrings are adorable! Such cute designs.... Love unique uses for textiles and the earrings are fab! Thanks for stopping by The Organic Blonde too! so beautiful i really hope i win!! simoni einai apla teleiaaaa ! !kali mas epityxia! !